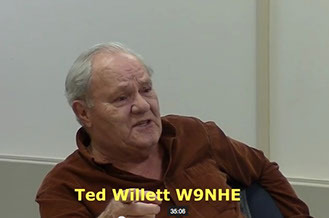 One afternoon in 1952 I (TED WILLITT W9NHE) asked Earl(W9LUQ), "I think we should start an Amateur radio club", So I put a add in the Fond du lac Commonwealth Reporter, a week later, the first meeting was held at KFIZ in studio B, There was about 15 or so showed up. The next meeting was then held in the basement of Clintworth TV Sales & service, we had about 25 or so at that meeting. From the TV service shop we moved the meeting place to the Fond du Lac Vocational School Annex for a few years, even had code and theory classes going. 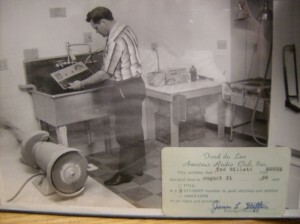 We now had a radio club. just needed a name... it was voted, "The Fond du Lac Mic & Key Club". After using the name from 1953 to 1955, when we went to register the name, we found that it was taken by the "Green Bay Mic & Key Club" in Greed Bay, Wisconsin.. So we just settled for "THE FOND DU LAC AMATEUR RADIO CLUB". By this time the club was well underway, we had a roster with some 44 members. Earl, W9LUQ, Fred, W9UFW and my self met with Victor Capplie, who was the mayor of Fond du Lac at the time, I knew Him from chumming around with his son. We wanted to know if the club could use a small vacated building, that was used by the "FDL Water ski club" He gave us permission, We now had a club house, the sad part it was located in front of the boat house's right under the big high tension lines, needless to say, our radios only receive the 35 db over S-nine power line noise. Many, many times we requested to the City to have the club house moved, to no avail. We had all radio events covered, from ARRL contest and one of the biggies was Field day, the first one was at KFIZ "Swamp" site off Scott Street before the tower was erected. Hidden transmitter hunts on 6 meters every Friday night, with starts at "The Beer HUT". We even provided the commutations on 75 meters for the "Winnebago marathon outboard motor races". Broad casting the race over KFIZ, with permission from the FCC, Earl and I installed his Elmc AF-67 in a Cessna 182 to transmit back to KFIZ on 10 meters, with Mr. Joe Gazer as the pouncer, I did the operating of the 10 meter rig that was strapped in the back seat next to me in the airplane. The club did that event ever year until the end of it. I remember that we had one heck of a time getting the 75 meter half wave dipole from top of the light house a-crossed the "Big Hole" channel to the "Yacht Club" flag pole, which was the base station in the light house. We had stations set up along the race course, from Oshkosh to Butte des Moris, winneconne, and all way to the first Dam and then back to FDL. The club set up stations at "The Annual Hoppy Show" at Goodrich Senior High School was always a big success. We had found that the City of Fond du Lac didn't want anything to do with us Hams. Problems with TVI complaints form the public, I guess, with most of on six and channel two TV in greed Bay was a mess, We even put together a TVI committee to help cope with the public. We found out that Fond du Lac county was the only county that did not have a major Ham radio network in place. As time past, we finely, in 1958 Got our point a crossed to the city of Fond du Lac officials and county officials with help of Maggie Smith, whom was a reporter for Fond du lac Commonwealth paper, she and myself and her husband Bob, W9EBV went to Madison to plead with state that we could build an emergency radio network system for Fond du Lac county. When the city gave us the go, the network was on 6 meters, was tested by the group with mobile and portable rigs. After some demonstration we where sanction by State, County, and the City . GUESS WHAT ? In 1962 the city even moved the club house to the other side of Lake Side Park. QSL Cards are exchanged by Amateur Radio Operators to confirm a QSO (on-the-air-contact) with each other. QSL cards from other countries are highly-prized by U.S. hams. A ham's QSL card can be very unique and very few will look the same. The cards we use are shown below. One use of these cards is to verify operating accomplishments and qualifications for awards, such as the Worked All States or Worked All Countries award.